The tourist center between Hechuan City and the Beibei District is mainly composed of the scenic spots on Jinyun Mountain, the ancient battlefield at the Fishing Castle, and other national spots of scenic and historic interest as well as the North Hotspring Park and the Jinyun Temple. Known as the Lesser Emei Mountain, Jinyun Mountain is over 60 kilometers from urban Chongqing. The imposing Lion Peak, the main peak, stands like a crouching lion. Yujian Peak, the highest of the mountain, rises 1,030 meters above sea level. Jinyuan Mountain has 1,400 hectares of trees. 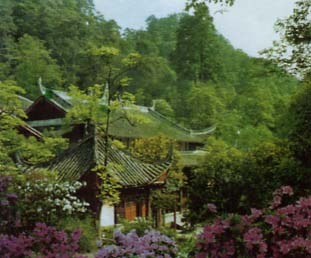 The mountain is hence called a "world's botanical garden." It is on Fishing Mountain, six kilomters from the city of Hechuan and 93 kilometers from Chongqing. The 400-meter-high Fishing Mountain extends in the shape of along peninsular with the Qujiang, Fujiang, and Jialing rivers flowing on three sides. The castle is strategically situated and difficult of access, with sheer cliffs rising abruptly on all sides. It was once a battlefield during the Southern Song Dynasty (1127-1279). There are six city gates extant and a 6.5-kilometer-long city wall from the Song Dynasty (960-1279).